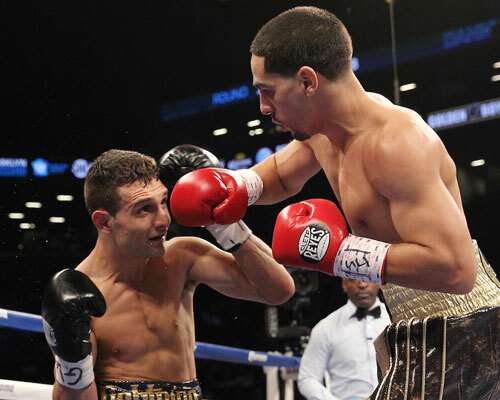 World junior welterweight champion Danny Garcia brutalized Ron Salka in round two of a scheduled 10-round non-title bout at the Barclays Center in Brooklyn, NY. 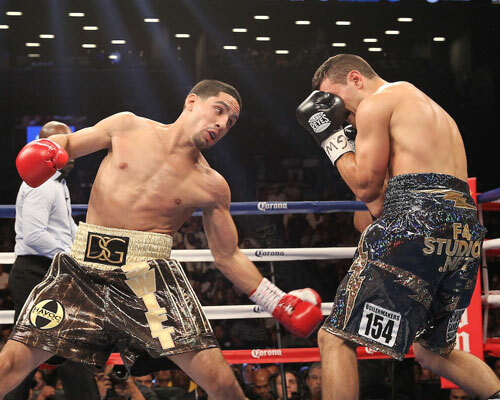 Garcia put on a stunning display of power-punching that overwhelmed Salka and produced three showy knockdowns. The 142-pound catch-weight contest was the main event of a nine-bout bout card promoted by Golden Boy and televised live by Showtime. The fight started carefully, with the boxers feeling each other out in the opening round. Garcia, of Philadelphia, tested Pittsburgh's Salka to the body, and Salka landed a nice left hook to Garcia's chin. But the round ended without major incident. However, things were about to change very quickly. In the second, Garcia slugged Salka with a left hook that staggered him badly. Salka backed toward the ropes on wobbly legs and glanced wildly at the referee. Garcia stepped in and launched an overhand right that landed heavily and drove Salka to the floor. The injured fighter regained his feet, but Garcia, sensing the kill, pounced right on him. 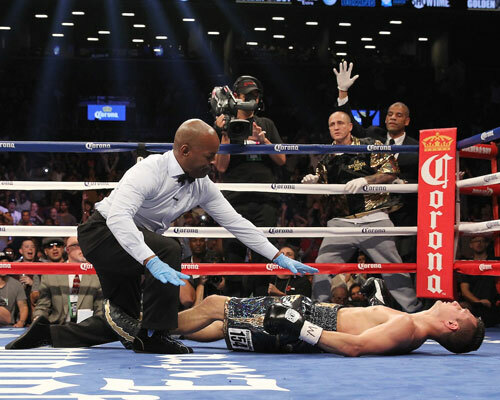 Garcia stalked his opponent around the ring and threw hard shots to the head and body. Many punches landed. 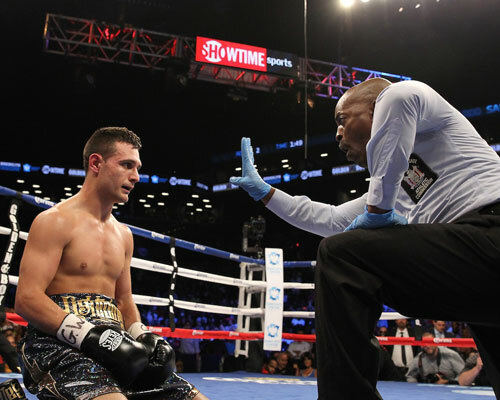 Another right hand hurt Salka, a smart guy in and out of the ring, and he decided to take a knee to regroup. 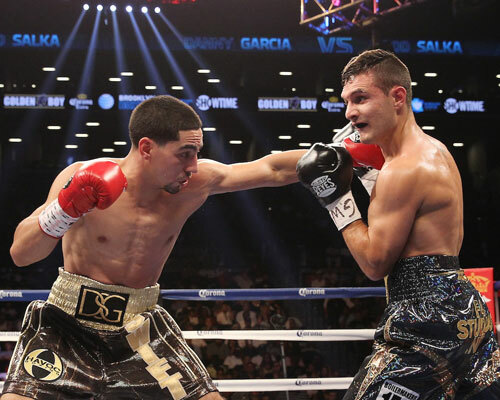 When the action resumed, Salka still looked shaky and Garcia, as sharp as he’s ever looked, was just hitting a full head of steam. It was clear that the bout would not last much longer. Garcia punched away at Salka, staggering him with each blow. Impressively, Danny never forgot about the body and continued to punish it, along with everything else he hit. Garcia landed a big left hook to Rod’s chin. Salka took the punch and pounded his chest. A second later, Garcia stepped in and drilled Salka with a vicious left hook that sent him down for the third and final time. When Salka hit the mat, referee Steve Willis immediately waved an end to the bout. At the same time, a towel from Salka’s corner flew into the ring. Everyone was in agreement; the massacre was over. The time of the stoppage was 2:31 of round two. Going into the fight, Salka had been installed as a 34-1 underdog. Nothing that happened in the ring belied those imposing odds. This was a fight that was criticized from the moment it was announced. First planned as a fight for Garcia's title belts, it was downgraded to a non-title affair when the WBA and WBC refused to sanction it. Salka, normally a lightweight - and a small one at that - was given little chance to survive the bout. As it turned out, Salka truly was in over his head against Garcia. Leading up to fight night, the champion heard his share of flak for accepting an unranked opponent, but to his credit, Garcia prepared well for Salka, and won the bout in impressive fashion. He did exactly what he needed to do in the fight, and left no questions except who was next on his agenda. No one in Brooklyn could argue with that. Assuming he next faces a significant opponent at 140 pounds, one last time before moving up to welterweight, Garcia will easily leave behind whatever controversy this fight stirred up. The obvious opponent for Garcia is Lamont Peterson, also a winner on this night and the holder of the IBF junior welterweight title. "I’m about fighting the best fighters,” Garcia said. If he (Peterson) wants it, he can get it too. Because that’s what I do. I’m a fighter." It would be a good matchup that would further clarify who is the best 140-pounder in the world, although few could dispute that Garcia is already at the top of that list. 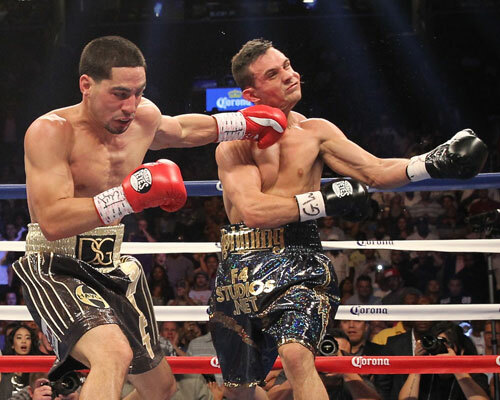 The quick victory over Salka extended Garcia's record to 29-0, 17 KOs. Salka, 19-4, 3 KOs, failed to produce the shocker he had hoped for, but should be able to return to the lightweight division no worse for wear. 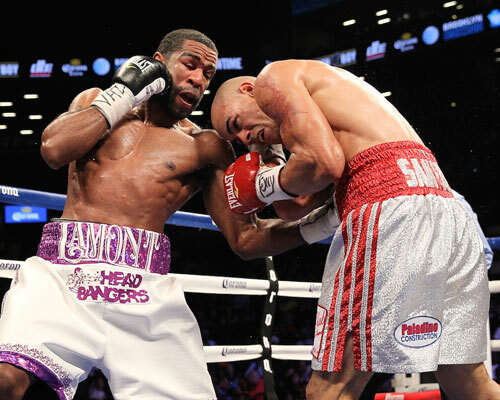 Lamont Peterson, Washington, DC, defended his IBF junior welterweight title with a 10th round TKO of New York's Edgar Santana. Peterson, 33-2-1, 16 KOs, scored well with a blistering body attack throughout the fight and landed chopping power shots all night long. Peterson kept the fight on the inside most of the way, only using his feet to reposition himself and to take an occasional breather. The rest of the time, he stayed in the pocket and chopped away at his rugged foe. Santana, 29-5, 20 KOs, landed as well, but Peterson outworked him in every round. There were no knockdowns in the fight, but the fifth round could have been scored 10-8, given the amount of punishment Peterson dished out. In fact, one official, Don Trella, did score the round that way. Finally in round ten, with Peterson landing freely to the head and body, the ringside physician signaled that he wanted the fight to be stopped. Referee Pete Santiago halted it at 2:48 of the tenth. "I'm not disappointed (that I didn't stop him sooner)," Peterson said after the fight. "(I wanted to) just work hard and build for the next one." 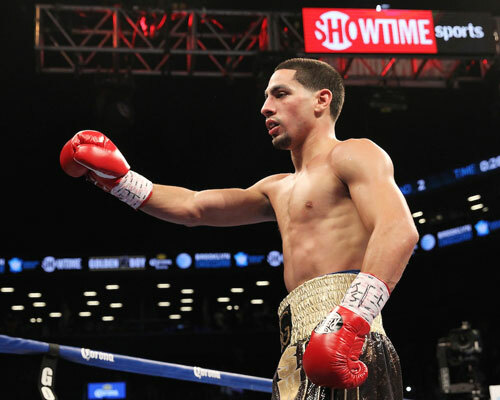 Now that Peterson had won his fight, everyone wondered if Danny Garcia was that ‘next one’, in a fight for three shares of the junior welterweight title. "I hope so," Peterson said. "We'll see." It was bombs away in the first round of the Daniel Jacobs - Jarrod Fletcher vacant WBA middleweight championship fight. Jacobs, Brooklyn, came out fast and dropped Fletcher with a nasty left hook in round one. After that, it seemed that every punch Jacobs threw hurt the Australian, but somehow he made it to the end of the round. Then in round two, Jacobs appeared to ease off for some reason, instead of going for the knockout. "When I hurt him in the first round and he didn't go out, I wanted to pace myself and not get tired," Jacobs said. 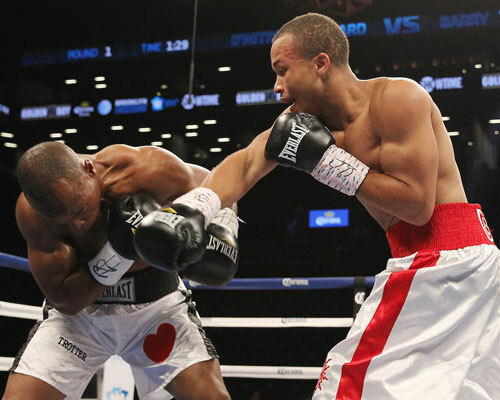 Jacobs kept the upper hand as the rounds ticked by, but he never came close to putting his opponent down again. However, in round five, just when Fletcher appeared to be getting brave, Jacobs refocused and went for the kill. A hard left hook softened Fletcher before a pair of rights put him on the canvas once again. Referee Michael Griffin stepped in and stopped the fight at 2:58 of round five. 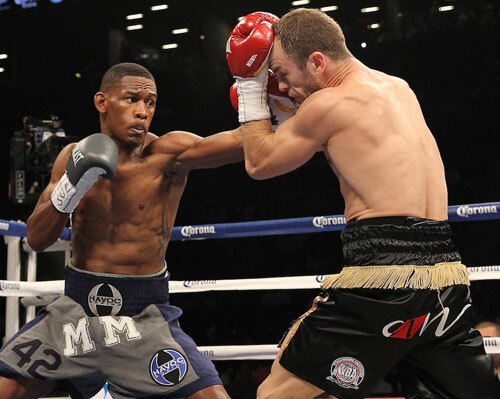 Jacobs improved to 28-1, 25 KOs, and laid claim to the WBA "regular" middleweight championship. Fletcher fell to 18-2, 10 KOs. Showtime televised the Garcia-Salka, Peterson-Santana, and Jacobs-Fletcher. Brooklyn's Sadam Ali, claimed the vacant WBO Inter-Continental welterweight title with an exciting 10-round split decision over Jeremy Bryan of Paterson, NJ. The fight was a see-saw slugfest, with Bryan hurting Ali in rounds three and four, and Ali returning the favor in the fifth and sixth. The battle quieted for a couple of rounds before Ali dropped Bryan with a beauty of a left hook in round nine. The extra point from the knockdown gave Ali some extra breathing room on the official cards, but one judge still favored Bryan. Judge Tom Schreck scored the fight for Bryan, 96-93, while John McKaie and Robert Perez both liked Ali, 96-93. The win made Ali 20-0, 12 KOs, and earned him that regional title belt. Bryan left the ring 17-4, 7 KOs. In a feisty junior welterweight bout, Brooklyn's Zachary Ochoa stretched his undefeated streak to 8-0, 4 KOs, with a 6-round unanimous decision over Luis Cervantes, Palm Springs, CA, 7-8-3. Cervantes was the aggressor throughout, but Ochoa landed the cleaner punches, especially in the first half of the fight. Things got closer in the last three rounds, when Cervantes began landing more, and often kept Ochoa pinned in the corners. In round five, Cervantes was warned for hitting low. Then when the boxers resumed the fight, Cervantes offered an apologetic glove-tap, but instead of making peace, Ochoa chose to fire a right to Cervantes' chin. The Brooklyn crowd loved it. The final two rounds of the fight were gritty, and the best of the bout. When it was over, all three judges favored Ochoa by scores of 60-54 (twice) and 59-55. Anthony Peterson, Washington, DC, the younger brother of world champ Lamont Peterson, scored an impressive first-round KO of Mexican Edgar Riovalle, in their scheduled 10-round welterweight bout. With about 30 seconds remaining in the opening round, Peterson, 34-1, 22 KOs, crushed Riovalle, 37-19-2, 26 KOs, with a brutal left hook. Riovalle fell hard to the canvas and took the full ten count from referee Tony Chiarantano. The time was 2:41. 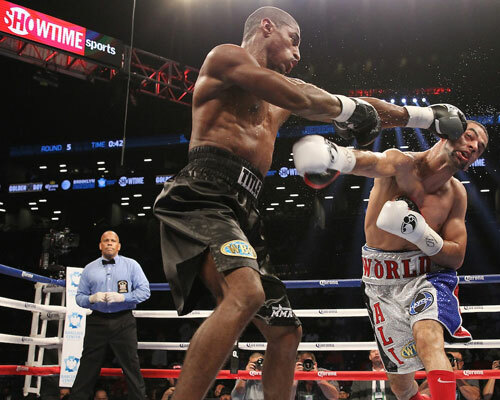 The Peterson-Riovalle, Ochoa-Cervantes, and Ali-Bryan bouts were televised live on Showtime Extreme. 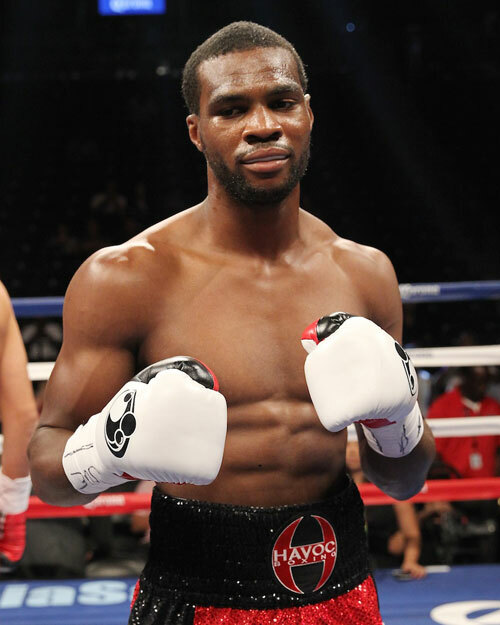 In a scheduled light heavyweight 10-rounder, Marcus Browne, Staten Island, NY, made quick work of Oakland, CA's Paul Vasquez. Browne came out swinging and backed Vasquez into a neutral corner with a hard right. A right hand to the body and a left to the head crumbled Vasquez downward and referee Eddie Claudio, immediately stopped the fight at 28 seconds of the first. Browne remained undefeated, 12-0, 9 KOs. For Vasquez, 10-6-1, 3 KOs, it was his second straight loss in the first round. 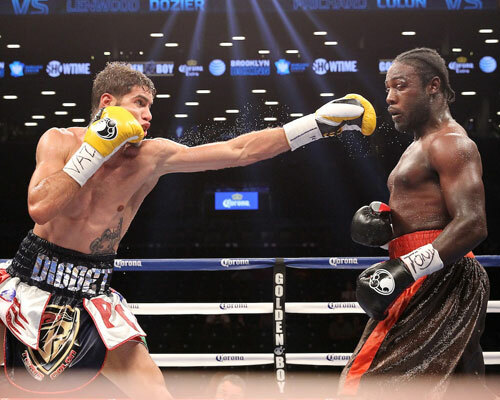 In a 6-round junior middleweight bout, undefeated Prichard Colon, Orocovis, PR, was extended to the final bell for the first time in his career by Washington, DC survivor Lenwood Dozier. In a workmanlike performance, Colon, 11-0, 10 KOs, won every round against Dozier, 9-7-1, 4 KOs, and although in the final few rounds the Puerto Rican pressed hard to keep his knockout streak alive, had to settle for three official shutout scores of 60-54. In the opening fight of the night, super middleweight D'metrius Ballard, Temple Hills, MD, scored a first round TKO of Barry Trotter, Columbus, MD, to remain undefeated. It was a competitive round with Trotter landing a few good left hooks and Ballard more active with his right. Finally Ballard, 6-0, 5 KOs, trapped Trotter, 2-2, 1 KO, along the ropes around the two minute mark, and hurt him with a volley of punches. Ballard kept throwing until referee Tony Chiarantano stepped in to stop it. The time was 2:35 of the first. Trotter fell to 2-2, 1 KO. A decent crowd of about 7,000 half-filled the Barclays Center by the time the main bouts began.